It was not perfect but it was a close to a complete game as the Seahawks have played in a long time. 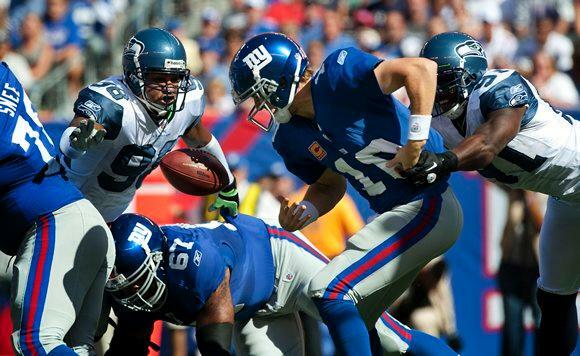 In front of 68,352 raucous fans the Seahawks came back from a 17-14 halftime deficit to beat the New York Giants 38-17. 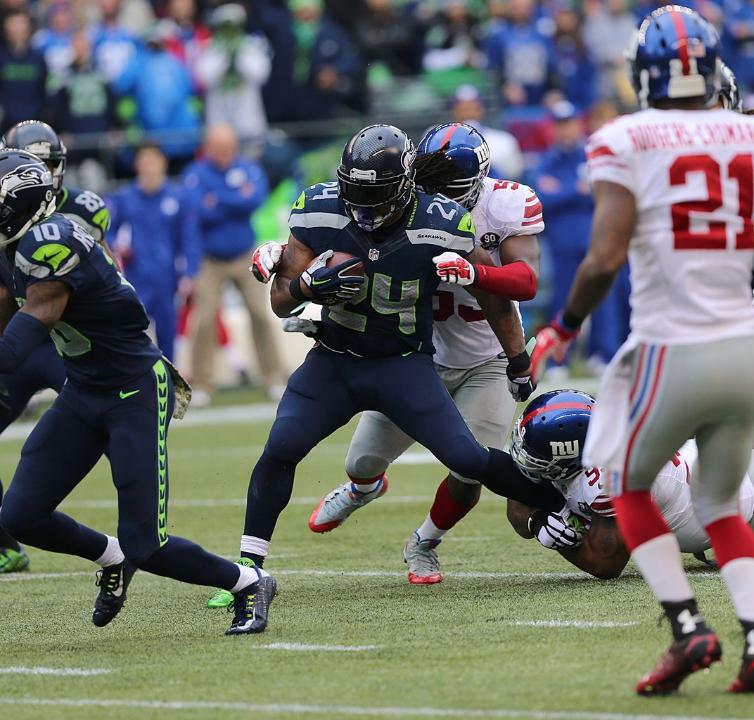 The Seahawks set a franchise record with 350 rushing yards including 5 touchdowns on the ground. With the win the Seahawks are now 6-3 and remain 2 games back of the Arizona Cardinals for first place in the NFC West. The Giants fall to 3-6 and continue to struggle to be relevant. Here is what I took out of today’s victory. Have a Day, Beast Mode: Today the Seahawks established the running game with Marshawn Lynch and then some. Lynch ran the ball 21 times for 140 yards and 4 touchdowns; by far his best game of the season. As I previously mentioned the Seahawks broke a franchise record running for 350 yards on Sunday. Associated categories favored the Seahawks as well, especially time of possession as the Seahawks controlled the ball 7 minutes longer than the Giants. It is not a secret that if you are successful running the ball the chances of you winning are greater. That is not my main point. What is important is that this performance should silence any speculation of Lynch’s possible lack of motivation. Robert Turbin and Christine Michael saw their touches this week but this performance showed loud and clear that Lynch is still out go-to guy in the backfield. Leave any talk about his future on the sidelines for now. For now, let him go out there and be the player we all know he is, the player that showed up big time on Sunday. First Half Defense: In the first half the Seahawks defense gave up 17 points, 7 of which coming off of turnovers. After the first 30 minutes it looked like Eli Manning was going to pick the Seahawks defense apart all game long. The worst part was that it looked like Seattle was going to let him, as once again we could not establish a solid pass rush. Giants quarterback Eli Manning was not sacked in the first half and the New York offensive line gave Manning a clean pocket for the majority of the half. In the first half Manning threw for 192 yards and a touchdown; a stat line that should be unacceptable especially at home. Fortunately the defense stepped up in the second half, preventing any chance of a New York sized upset. Second Half Defense: On paper the Seahawks defense played a near-flawless game in the second half. The Seahawks sacked Eli Manning twice, picked him off once, and best of all allowed 0 points. The momentum tilted Seattle’s way for good after Manning’s interception, a pass which was tipped by Richard Sherman to Earl Thomas in the endzone and brought out to the Seahawks 42-yard line. Seattle then went on to score 21 points in the final 15:39 of the game. If the defense can play a complete game we will be a very dangerous team moving forward. The inconsistency of Seattle’s pass rush is what could prevent us from closing out any potentially close games in the coming weeks. I believe we are about to turn a corner, but Dan Quinn needs to take the risk and dial up more early down pressure. Two sacks of Eli Manning is simply not okay in my eyes. Turnovers and Ball Security Issues: Today was a rare example of the Seahawks losing the turnover battle but finding a way to win the game. The Seahawks committed 3 turnovers this week while only forcing 2 of their own. Seattle also fumbled two more times but they were able to get back on top of the ball both times. The Seahawks have not had consistent turnover problems so I do not expect this to be the start of a negative trend. This is an area that we can patch up in practice this week. Having said this we do go on the road next week into a very hostile environment. If we struggle to maintain possession of the ball again next week, this topic may be brought to the forefront as we enter the NFC West gauntlet after our game in Kansas City. Thoughts on the Giants: Let’s start with the obvious; the Giants run defense played an absolute terrible game. The Seahawks were able to get to the second and third levels of New York’s defense several times on Sunday and the Giants did not help themselves along the defensive line, as they were extremely unsuccessful in patching up holes for Marshawn Lynch to run through. On offense the Giants have good young talent in receivers Rueben Randle and Odell Beckham Jr. and perhaps having Victor Cruz could have helped the Giants passing attack. Eli Manning made a couple very pretty completions where he arched the ball right into the chest of his receiver. The Giants simply need to stock up more young talent. Their 2014 season is virtually over, but in the unpredictable NFC East it is not unreasonable to think the Giants could get right back into playoff contention in 2015. Random Thoughts: There was a lot of camouflage around CenturyLink Field on Sunday. Everywhere you looked you saw it, similar to how in past seasons you couldn’t walk around without seeing a barrage of pink during breast cancer awareness month… As delicious as that egg nog latte I got from Starbucks was, I might have to cool it on the coffee before future prefunctions. Definitely battling a headache and the jitters right now which could only come from a coffee/beer mix… Thank God I have undercover seats. This has been one of the more indefinite weather home slates in recent memory… We had a Giants fan walking up our aisle who acted like he owned the place. Made me believe he was truly from New York. Good thing he sat several rows behind me because he may have gotten into a shouting match with the characters that sit around me… One pet peeve that I have never talked about is that there is never a good time to take a bathroom break. Either we are on defense and I want to stay in my seats to make noise, or we are on offense and I want to see if we can move the ball. Honestly, it is best to take a bathroom break when we are on offense in my opinion… With Carson Palmer out now is the time for the Seahawks to take advantage and regain ground in the division race. A win in Kansas City would be HUGE for our chances to retake the division. Check back next Saturday morning as I preview our week 11 game against the Kansas City Chiefs. Go Hawks!